Find a game that catches us in body and soul is complicated, and especially on mobile platforms, in which games are usually more to kill the time than anything else. However, there are exceptions. Today we bring you Starman: Tale of Light , a game that we assure you will make this weekend a much better one. This game has won the love of the general public , and if you want to try it, you should take advantage of that Apple is offering it for free. You just have to follow the simple steps that we will leave you below. In this curious and entertaining game you will have to guide the protagonist through the beautiful and architectural scenarios , designed specifically to make it a challenge to overcome them. Only managing to overcome the obstacles and puzzles that are added as you advance in your adventure, you will be able to recover the light and give life to everything again. In Starman we assure you that you will not find any puzzle similar to another , each one assures you a challenge by itself. In addition, thanks to its soundtrack, you ensure an unprecedented immersion. Go to the App Store and download the Apple Store app. Once you have the app installed, open it . When the window opens, click on download . You will be asked if you want to go to the App Store, you just have to accept it . When the iTunes window appears, tap the Redeem option on the right. Ready. Now you can enjoy your new game once you have it installed on your iPhone. 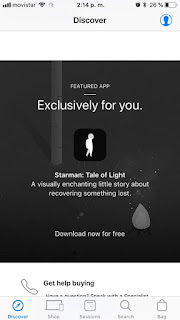 Starman: Tale of Light seems like a pretty beautiful game, and we are sure that you will like it as much as we do. We recommend playing it with headphones and in a lot of calm, to get into the story as much as possible.